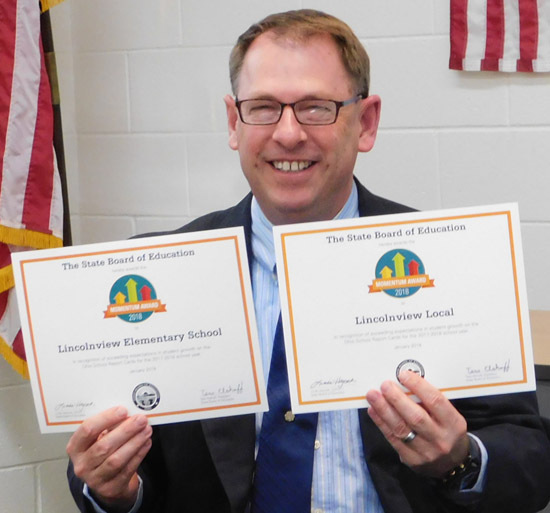 Lincolnview Superintendent Jeff Snyder shares certificates presented by State Superintendent Paulo DeMaria. Future state funding for schools was a topic addressed during Wednesday night’s meeting of the Lincolnview Local Board of Education. During his monthly report to the board, Treasurer Troy Bowersock noted there are two school funding plans — one by State Representatives Bob Cupp (R-Lima) and John Patterson (D-Jefferson), and another by Governor Mike DeWine. “The Governor’s proposal is not as friendly to us, although we would get a little bit of an increase,” Bowersock added. He also noted the school system has seen virtually no increase in funding since 2005. Eric Germann, who serve as the board’s legislative liaison, questioned if the Cupp-Patterson proposal would make it into the budget, with Superintendent Jeffrey Snyder adding his opinion on the subject. In other business, Snyder shared a Twitter video posted by State Superintendent Paulo DeMaria after last month’s visit to Lincolnview Local Schools, and he shared the prestigious Momentum Award given by DeMaria. A Van Wert man was sent to prison during sentencing held Wednesday in Van Wert County Common Pleas Court. Sean Ramos, 25, was sentenced to 17 months on a fourth-degree degree felony charge of attempted tampering with evidence, as well as two 180-day jail sentences on one count each of domestic violence and theft, each a misdemeanor of the first degree. Judge Martin D. Burchfield gave Ramos credit for 102 days already served. Two other people were sentenced on Wednesday. Michael Imler, 39, of Ohio City, was given two years of community control, 90 days in jail, all suspended, and fined $1,000, which was also suspended, on a charge of endangering children, a misdemeanor of the first degree. Kasey Shisler, 30, of Van Wert, was sentenced to 90 days in jail, with credit for eight days already served, on a charge of possession of drugs, a felony of the fifth degree. Also this week, Eric Gibson, 31, of Delphos, pleaded not guilty to two counts of aggravated trafficking in drugs, both felonies of the third degree; two counts of possession of drugs, each a misdemeanor of the first degree; and trafficking in heroin, a fourth-degree felony. He was released on an unsecured personal surety bond after signing a waiver of extradition, and will appear for a pretrial conference at 9 a.m. Friday, May 10. Three people changed their pleas during hearings in Common Pleas Court. Travis Gaskill, 29, of Van Wert, changed his plea to guilty to a charge of having weapons under disability, a felony of the third degree. 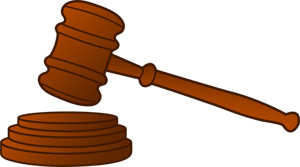 A presentence investigation was ordered and sentencing scheduled for 2 p.m. Tuesday, May 30. Candice Huffman, 33, of Van Wert, entered a guilty plea to a prosecutor’s bill of information charging her with one count each of trespass in a habitation and theft of drugs, each a felony of the fourth degree. The pleas were made prior to the beginning of a jury trial scheduled for Monday. Judge Burchfield ordered a presentence investigation and Huffman will appear for sentencing at 9 a.m. Wednesday, May 22. 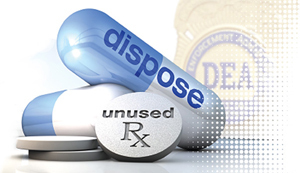 Van Wert County Sheriff Thomas M. Riggenbach has announced that this Saturday, April 27, his office will again be participating in the National Prescription Drug Take Back Day. The Sheriff’s Office is working in conjunction with the U.S. Drug Enforcement Agency to give Van Wert County residents another opportunity to rid their homes of potentially dangerous expired, unused, and unwanted prescription drugs, while also helping prevent pill abuse and theft. Residents can bring their pills for disposal to the Sheriff’s Office, 113 N. Market St. in Van Wert, at any time this Saturday. This is a free service and residents can remain anonymous when dropping off medications, no questions asked. Sheriff Riggenbach reminds residents the Sheriff’s Office is no longer able to accept liquid medications, new or used needles or syringes, or other non-pill forms of medication. The sheriff said his office will continue to receive medications in pill form. Sheriff Riggenbach asks residents to remove the pill medications from the bottles or blister packs and put the pills in a bag or box before bringing the pill medications to the Sheriff’s Office. Residents can then remove all labels containing identifying information from the bottles and blister packs before throwing the empty bottles and blister packs in the trash. County residents should then make all personal information on the labels illegible before throwing the labels in the trash. The sheriff also said his office cannot receive pill form medications from businesses. The Van Wert City/County DARE Team announces its upcoming 24th annual DARE Golf Outing. The tournament will be held at Hickory Sticks Golf Course in Van Wert on Saturday, May 11, with a shotgun start at 9 that morning. Rain date for the tournament will be Sunday, May 19. The Fraternal Order of Police Lodge will be hosting the outing again this year for DARE. All proceeds from the tournament will go back to the youth of the community by helping to fund its DARE education on the hazardous effects of drugs, alcohol, and violence. DARE also teaches youngsters important family values and other important issues that children need throughout their lives. DARE is self-funded program, so it is through fundraisers like the golf outing that it is able to continue to help county young people. In addition to the golf, there is also a chance to win $10,000 through a “hole-in-one” contest at hole No. 4. This is the 20th year Young’s Waste Service has sponsored the contest. There are also three other bonus holes with a chance to win other prizes. Young’s Waste Service has supported the DARE program ever since the business opened because company owners feel the DARE program does make a difference in the community. Organizers are still looking for hole sponsors at a cost of $100. That donation provides companies with a sign with their business name on it posted at the sponsored golf hole. The cost to golf in the tournament is $60 per person, which includes golf, cart, door prizes, and lunch. Again this year, breakfast sandwiches will be available before the start of the tournament for a free-will donation. Those interested in golfing or sponsoring a hole can contact Deputy Biberstine or Deputy Gabriel at 419.238.3866 or Officer Greg Blackmore at 419.238.2462. Van Wert County’s unemployment decreased a half-percent, giving the county the eighth-lowest jobless rate in March, according to figures released Tuesday by the Ohio Department of Job and Family Services. 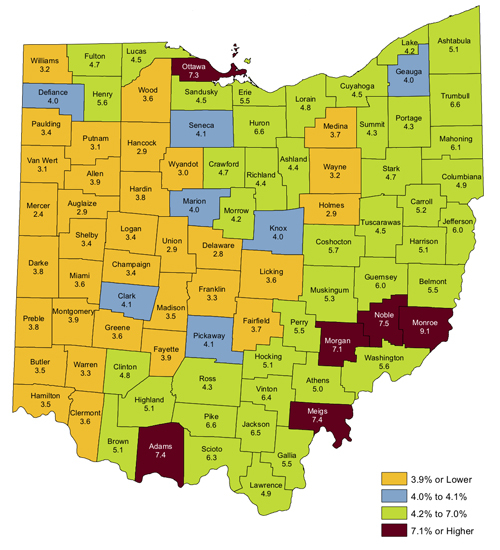 Unemployment rates decreased in all but one of Ohio’s 88 counties, while remaining the same in the lone county that didn’t see a decrease. Van Wert County’s unemployment stood at 3.1 percent in March, down five-tenths of a percent from February’s 3.6 percent. That give the county the 81st lowest Ohio county unemployment rate. According to civilian labor force estimates compiled by the ODJFS, in conjunction with the U.S. Labor Department’s Bureau of Labor Statistics, the county’s workforce increased by 100, from 14,400 to 14,500, while those employed also rose 100, from 13,900 in February to 14,000 in March. Those unemployed remained the same at an estimated 500 people. Among neighboring counties, Mercer County was again the lowest county, both in the area and across the state. Mercer County had a jobless rate of 2.4 percent in March, down from 2.9 percent in February. Auglaize County was second at 2.9 percent, down four-tenths of a percent from February’s 3.3 percent. Van Wert County and Putnam County tied for third at 3.1 percent, with Putnam County decreasing seven-tenths of a percent from February’s unemployment rate of 3.8 percent. 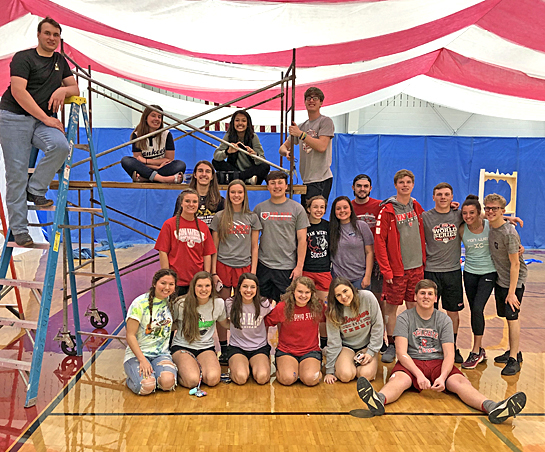 The Van Wert High School Junior Class invites the public to the Prom Open House this Saturday, April 27, from 1-3 p.m. in the Van Wert Middle School gymnasium. This year, students chose ‘The Greatest Show’ as the theme. Come and see how the class transformed the gym for prom and be sure to get a picture with the characters from The Greatest Showman. Enter the open house on the north side of the building, middle school door number M-44. The public is also invited to attend promenade from 7-8 that evening in the high school gym. Park on the north side of the building behind the middle school gym and enter through door M-44. Follow the signs to the high school gym for promenade. A number of Van Wert High School student artists need local residents’ help to earn the school $75,000 for its art education program. VWHS is a top 50 school in the running to win the $75,000 art education program donation, thanks to the Vans Custom Culture competition. However, the local students need people’s help to rally the community and help them become one of the top five finalists. 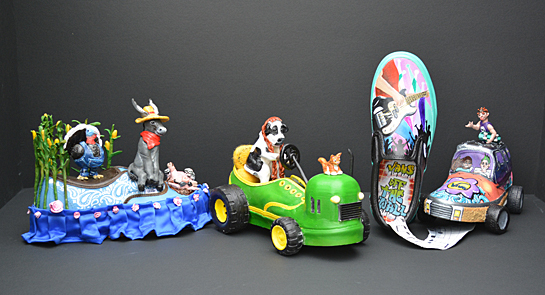 Shown are three VWHS students’ Vans shoe artwork. The grand prize winner will receive $75,000 for the school’s art program, a visit from Vans for a celebration on their school campus filled with art and music, and the four runners-up will be awarded $10,000 each and a limited-edition Vans gift. VWHS students who created their own Vans artwork include McKenzey Sanderson, Paige Moonshower, Katie McVaigh, Erin Cassidy, Savannah Nygren, Kathryn Wray, Jennifer Haggis, Ayana Rowe, Max Laney, Alexiz Metz, Casey Kiracofe, and Caton Williamson. From today through May 3, community residents need to spread the word and help VWHS students win much-needed support for their art program by visiting customculture.vans.com to cast their vote for the school. The American Red Cross has announced a number of local blood drives in Van Wert County in the next month or so. Monday, April 29, 8:15 a.m.-1 p.m., at Lincolnview High School’s Community Center. Thursday, May 2, 11 a.m.-5 p.m., at Van Wert Manor in Van Wert. Friday, May 3, 1-6 p.m., at Van Wert Health North’s Education Room. Monday, May 13, 2-6 p.m., Redeemer Lutheran Church in Convoy. Wednesday, May 22, 1-6 p.m., at Cooper Farms in a mobile unit. Friday, May 24, 10 a.m.-4 p.m., at American Legion Post 178 in Van Wert. Van Wert City Council looked at code enforcement issues again, while also approving legislation giving Safety-Service Director Jay Fleming the authority to seek bids for Issue 1-funded projects this summer. Health-Service-Safety Committee Chair Bill Marshall displays annual information on city code violations. 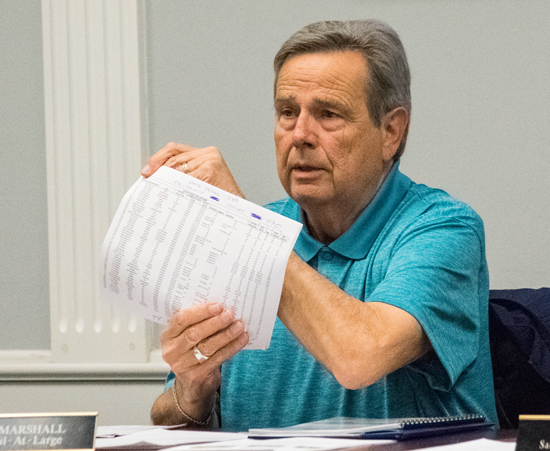 Councilman At-Large Bill Marshall, who chairs Council’s Health-Service-Safety Committee, talked about the increase in code violations from 2017 to 2018, noting there were 431 such violations two years ago, a number that increased to 540 last year. Although there have been just 106 code violations this year, Marshall said that number will likely significantly increase once warm weather is here to stay, since weed/grass violations make up the bulk of violations each year, although junk vehicles, old furniture and appliances, scrap metal, televisions, toilets, old carpet, and many other items can litter city properties. Marshall again pushed the city to hire at least a part-time code enforcement person, since Engineering Supervisor Bill Lawson doesn’t have the time or people to deal with violators. Unfortunately, City Auditor Martha Balyeat reminded Council, while the city is using a portion of the .22-percent Safety Capital Tax revenues to pay for police and fire salaries and benefits, no additional hiring can take place. Safety capital tax money has been used for a number of years as additional funding for the police and fire departments, since income tax and other revenues within the General Fund have not been sufficient to pay all General Fund expenses. CONVOY — It’s not expected to be ready until the 2020-2021 school year, but the Crestview Local Board of Education took some important steps toward opening a new early childhood center. 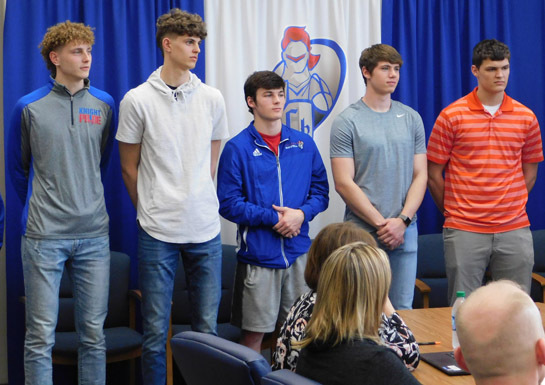 Members of the Division IV state champion Crestview Knights basketball team were honored during Monday night’s meeting. During Monday night’s monthly meeting, the board approved a motion to transfer $1 million from the general fund to the building fund for the upcoming ECC renovation project, and also agreed to interview three construction firms — Alexander and Bebout of Van Wert, Bruns Construction Enterprises of St. Henry, and H.A. Dorsten of Minster — during a special meeting scheduled for May 20. Mollenkopf added the board will know who the builder is by June 1. The early childhood center will be located at the former Vancrest of Convoy site, which was gifted to Crestview several months ago. The Division IV state champion Crestview basketball team was also present Monday and was recognized by the board. The Knights will also be honored at the Ohio Statehouse on May 8. Five area girls have been selected for the 2019 R.K. Thompson Self Reliance Award, according to Breanne Sudduth and Anthony Adams, co-chairs of the Van Wert Service Club’s selection committee. The awards banquet is to be held on Wednesday, May 1. The program provides cash awards to seniors at Van Wert County high schools who best exhibit the trait of self-reliance. These awards are designed to seek out and honor students who do the best with what they have. 2019 R.K. Thompson Self-Reliance Award girl finalists include (from the left) Noelle Heffner, Hannah Kraner, Brayden Langdon, Lindsey Hill, and Chloe Sidle. This year’s girl finalists include Noelle Heffner, daughter of Scott and Kimberly Heffner; Lindsey Hill, daughter of David and Angie Hill; Hannah Kraner, daughter of Mitchel and Robin Kraner; Brayden Langdon, daughter of Matt and Trina Langdon and Chloe Sidle, daughter of Brent Sidle and Sara Short. Heffner is a senior at Van Wert High School, where she is a member of National Honor Society, Beta Club, and Fellowship of Christian Athletes and serves as Student Council president. She also participated in the musical production, volleyball, and swim teams. Heffner participates in the CEO program at Van Wert Health. After graduation, she will attend The Ohio State University to pursue a degree in nursing. Heffner is currently employed at Sycamore Ice Cream and is a member of LifeHouse Church. Hill is a senior at Vantage Career Center, where she is enrolled in the Carpentry program. She is a member of the National Technical Honor Society and Student Ambassadors.